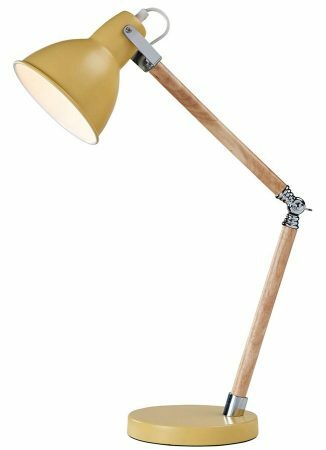 This Drake wooden retro style adjustable task lamp with yellow ochre metal detail and vintage style features a circular base in ochre, hinged wooden stem and adjustable ochre cone shade to direct the light just where you need it. The stem is locked in place using a polished chrome wing-nut and the shade tilts and swivels on a bright chrome stirrup. Fitted with inline cable switch. An on-trend desk lamp that fits with almost any stylish interior and great for the home office, study room, kids bedroom or alongside your chair for reading or any other task. The Drake range is available in a variety of finishes; please see below. Important – please note: This table lamp can only be used with an energy efficient 12w compact fluorescent or 10w LED lamp. Incandescent lamps must not be used.